…a Saturday "airshow" gone bad…! A SATURDAY in Airshows gone bad…! CINCINNATI, Ohio — A plane carrying a wing walker crashed at an airshow and exploded into flames Saturday, killing the pilot and stunt walker instantly, authorities said. The crash of the 450 HP Stearman happened at around 12:45 p.m. at the Vectren Air Show at Dayton International Airport. No spectators were hurt. 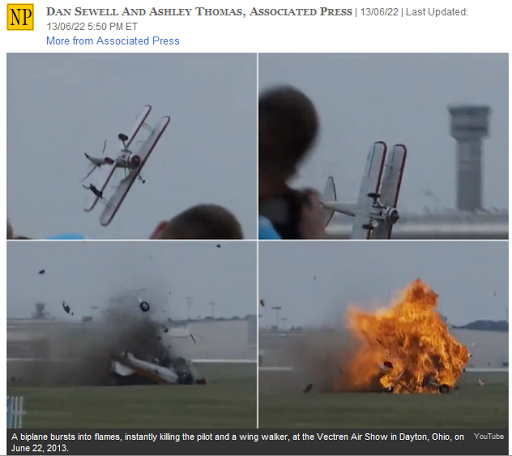 A video posted on WHIO-TV shows the plane turn upside-down as the performer sits on top of the wing. The plane then tilts and crashes to the ground, erupting into flames as spectators screamed. Ian Hoyt, an aviation photographer and licensed pilot from Findlay, was at the show with his girlfriend. He told The Associated Press he was taking photos as the plane passed by and had just raised his camera to take another shot. “Then I realized they were too low and too slow. And before I knew it, they hit the ground,” he said. He couldn’t tell exactly what happened, but it appeared that the plane stalled and didn’t have enough air speed, he said. ← …a big City flooded dirty Sunday…! Calgary downtown out…!